Today I met with Louise and John at Albert head lagoon, a small CRD park right near the gravel pit on Metchosin road. This would be my first outing in Juan De Fuca Strait. There are funny tidal rips all along here as well as rather large seal haul-outs. 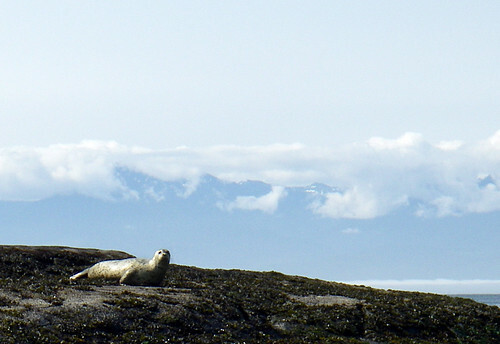 In one area, We saw over a dozen seals drop into the water - all from one rock! It was a tad windy today, and that makes the water wild even with the slightest breeze. There's significant fetch between Vancouver island and Port Angeles. The entire countryside is riddled with strange military installations, some active and some remnants of the pacific theatre. I got to the beach a bit late this morning to find Louise and John had just left shore. I quickly unloaded my boat and hopped down to a steeply sloping, but otherwise perfect beach. This is new territory for me, and this beach has me stoked. 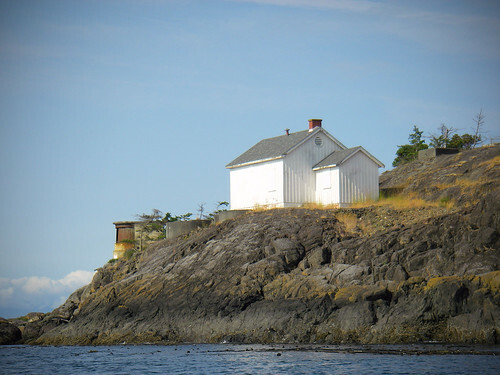 What a great place to put in for exploring the southern tip of the island. I rigged the boat and met the group over at the side of Albert head. The rocks out here sport all kinds of colorful algae and mosses above and below the tide line. The trees that try and grow are just gnarled and ravaged by seasons of gales. Probably not the best place to be in a strong southerly wind. 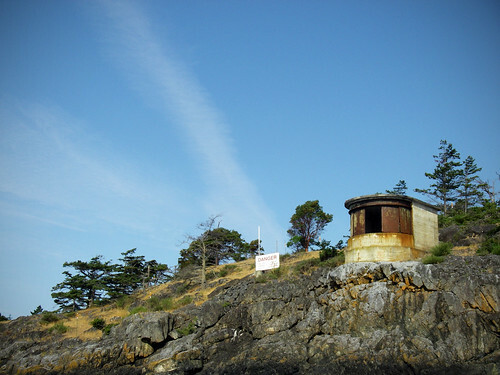 Albert head, or CFB Albert head, has a whole lot of those old turrets and various cement structures that spill out onto the adjacent rocks. There's this feeling of man made stuff attempting to hide in the natural environment. I sort of joked about the bit of swell out here, saying it was probably not a great day for that spontaneous paddle to Port Angles. 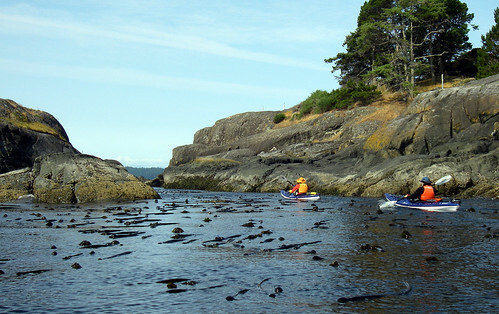 We paddled out around the head and John started heading for a kelp filled shortcut between the small island off the tip of Albert head. Try taking your sailboat through there :). There's lots of little shortcuts like this through the whole area. Passing through the small channel to the other side of Albert head, we were inundated by some fun swell traveling out of the bay. Lucky for us, the swell was moving with the wind, so it remained fairly glassy despite a pretty good wind in our faces. The current acts very counter intuitively on the south shores. Basically, we were out paddling at more or less full current at race rocks. The current out here, while pretty calm wants to take you out to sea during an ebb and push you toward shore during a flood. We were getting caught up in currents and kept saying to ourselves that it should be moving east to west, but this is that tidal rip style current that surfers fear. Next, we met the seals. 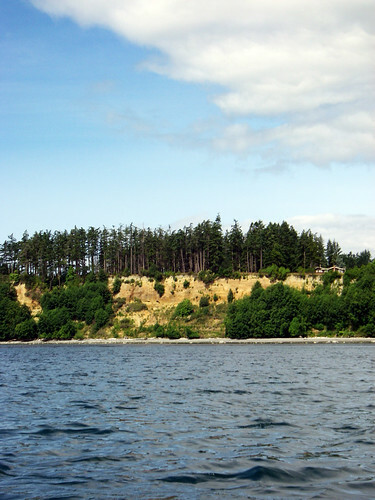 In the shadow of beautiful homes, we escaped the swell and wind in a group of islands just east of Witty's lagoon. Seals lined pretty much all of the shallow rocky faces on the points of the islands. They let out a loud huff as we paddled into the group of Islands. 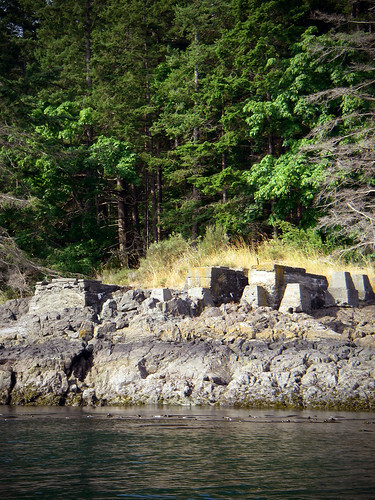 Some of them stayed on the rocks, so John probably got some great distance shots of them with his zoom lens. 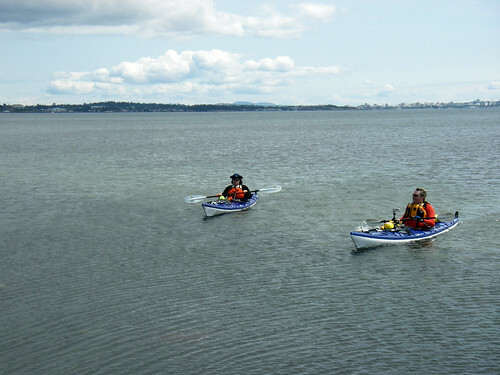 We paddled on through with a parade of seals following us. The seal population looks pretty sizable out here. We ended up at Witty's lagoon at a fairly low tide and saw a few Heron catching lunch. They'd walk along the intertidal area and fish while these white gull-looking birds were only a few feet away, dive bombing for their food. 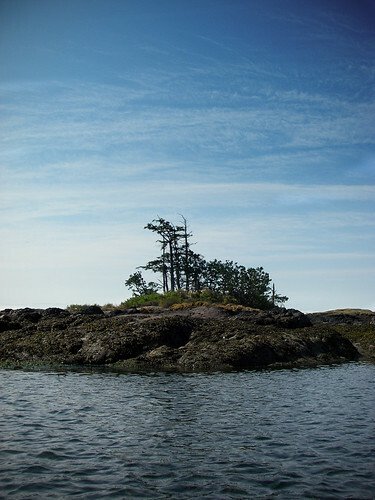 The white sand beach at Witty's disappears into kelpy, planty goo near the islets just off shore - it's pretty easy to kayak even as the tide goes out, but I'm not sure how much luck you'd have getting into the little estuary to the east at anything but high tide. We saw a few people having a go at skim boarding along the shoreline and thought we might head toward that end of the beach. As we got about half way across, we decided to turn around because the wind had increased quite a bit in force. We'll explore a little further in nicer conditions, but now I'm hooked on making it down to Parker bay some time this summer. When we turned around, it felt like the paddle was made of feathers and helium balloons. That little current took us back out to Albert head double time and the swell had diminished quite a bit as the wind changed direction while we were gone. I paddled out and saw a photo to take that was out a little further. When John saw me turn abruptly, he asked if I was going to Port Angeles after all. I said my goodbyes and started my long journey to Ameri... actually no, I just needed some distance for the shot. We got back to the beach and pulled out the boats. The tide a bit lower that when we left, which made for a steep climb to the parking lot, but at least there were no craggy rocks to worry about. When I got back to the van, I had a note on my van's window. The scooter people had found me skipping a ride to Metchosin this morning. Too many hobbies, not enough time!